PUNE: Every person has an author hidden within him or her , we should talk to them and unleash and discover the person within us opined well known crime journalist and author Hussain Zaidi. 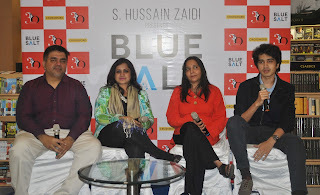 He along with Milee Ashwarya were hosting an event “Decoding the Criminal Mind” organized by Penguin Blue Salt. In a candid conversation with crime journalists and authors Jyoti Shelar , Sharmeen Hakim, Vibha Singh and young Bilal Siddiqi, the panel narrated their experiences of writing books on this subject and interviewing some of the most dreaded criminals . Hussein Zaidi said that Blue Salt Penguin is an initiative for those youngsters who are willing to write with a little bit of mentoring and hand holding. We want to fill the void. Narrating their experience , Authors of Six Minutes of Terror Nazia Sayed and Sharmeen Hakim said that coming out with the book was a huge challenge . The advantage was that we had covered the incidents on that day as journalists and so could relate to it. Nobody had written a book about the train blasts in Mumbai before. It was important as the city which never stops suddenly came to a standstill and the networks were jammed. Jyoti Shelar who penned The Bhais of Bengaluru said that going out of the city and writing about underworld in some other city was a challenge. Bangalore underworld was not known as that in Mumbai. I tried to trace the history and some events which helped transform the local criminals into the underworld mafia. Referring to her book Convenient Culprit Vibha Singh said that Life is stranger than fiction in a lot of ways. And fiction is inspired by the happenings around you. Once you start asking a lot of questions facts and fiction start to match up. A good writer should always read a lot. And everybody of us has favourite authors but with every experience we grow out of that . So I always concentrate on good content as every author doesn’t always deliver . Working as a catalyst for Nazia Sayed and Sharmeen Hakim the Authors of Six Minutes of Terror, Jyoti Shelar added that as a journalist you need to file your stories first and then burn the midnight oil and work hard for your book. As a journalist once you start reporting on crime you start to shed your fear and that helped in interviewing the dreaded criminals. Twenty Three Years Old and author of three books Bilal Siddiqi narrated his experience on authoring the book The Kiss of Life for Emraan Hashmi which talks about his son suffering from Cancer. I first thought it would be difficult but Emraan himself used to write large part of the story . However being in the shoes of a famous star and a father and then writing a book was a challenge. Applauding the dedication of Bilal , Hussain Zaidi said that unless your prodigy makes you feel insecure you won’t be successful and looking at Bilal I feel the same.